It’s Monday morning early and I’m still not over yesterday’s football games. The Denver/New England game was all about the quarterbacks and Peyton Manning and the Broncos put on a clinic from the start of the game until the finish. Tom Brady and Bill Belichick did a great job this year by getting this far, but they were totally outclassed by Denver in the AFC Championship game. Manning sliced and diced up the New England coverages as he and his teammates controlled the game from start to finish. He was especially effective on third and longs, which allowed Denver to control the ball and keep the sticks moving. 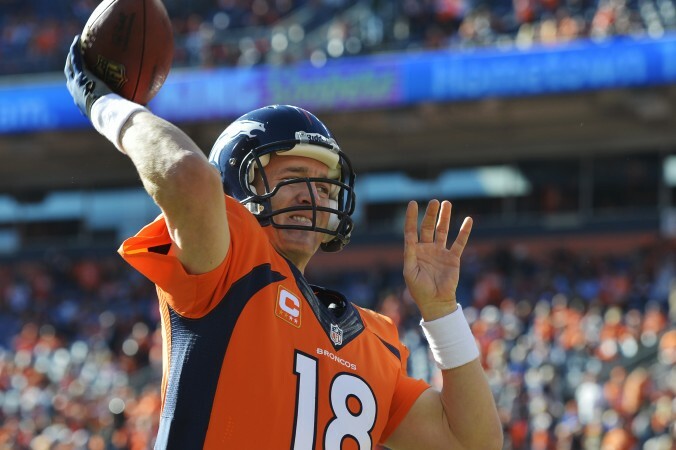 Manning completed 32 of 43 passes for 400 yards with two touchdown throws. His quarterback rating for the game was 118. He stepped up his game with everything on the line, now he needs to do it one more time against that tough Seahawks defense to be able to make a strong claim that he’s the best to ever play the position. I think he is the best regular season quarterback ever, but he hasn’t been anywhere near that level in the playoffs. Yesterday he played on the same level that he has played at in the regular season. Brady wasn’t at his best or anywhere near it against the Broncos. He missed a couple of wide open receivers, who might have scored had he connected with them. His deep passes were going much farther than he anticipated and he couldn’t seem to get in a groove. He completed 24 of 38 passes for 277 yards with one touchdown toss. His offensive line got outplayed by the Denver defensive front. Denver will be tough for the Seahawks to beat in the Super Bowl, if they play well. The Broncos offense is much better than the Seattle offense, but they must take care of the football against the best defense in the National Football League. Denver is going to need to get their tights ends involved more. The PED boys from Seattle are foaming out the mouth right now, and the Broncos are going to need to settle them down a bit. Moreno, Ball & Hillman are going to need to step it up also, as is the Denver defense. Brady is 4-5 in his last 9 Career Playoff Starts.. The invincability aura that surrounded him earlier in his Career has been lost.. He played a Poor Game thru the first 3 Quarters when his Patriots still had a chance in this Game … I think he has 1 more final Good Season before Coach Belecheck turns to Ryan Mallet for the Future..
Paulman, I hate the Pats more than anyone outside our division but that comment is ridiculous. Have to give credit. Its pretty impressive that the Pats made it to the AFC champ with all their injuries. Think about how much they lost on offense (gronk, hernandez even welker to FA) and defense (2 best players in Wilfork, Mayo). Take away the 2-3 best receiving options on any team and their best 2 players on D and tell me who gets to the division champ game. Also, I don’t get why everyone hypes this Mallet guy up. Based on exactly what? An 85% Brady is still better than most Teams QB in the NFL.. I go by watching him the last 3 Playoff Years in which he did not play very well last year versus the Ravens or the year before when the Ravens dropped a Winning TD Catch in the final Seconds.. All I am saying is that he is not all that “Tom Terrific” anymore and the Patriots have to think about moving on here within the next Season or 2 at most… Brady took a lot of hits this Year and is starting to look and play his age back there..
G Cobb called it right…Brady had a subpar game! He missed wide open receivers when he had a chance to hit them. When you dont put any pressure at all on Manning, he will pick you apart terribly…it wont be so easy against that tough Seattle defense!